Our hope is to spread the NVRQT spirit to every child who is fighting cancer. We are encouraging a nationwide effort to host local NVRQT Games in honor of children who have been sidelined by cancer. It's a fun and easy way to make a huge impact and more importantly, to show your support and raise awareness for some very special kids. Get creative! 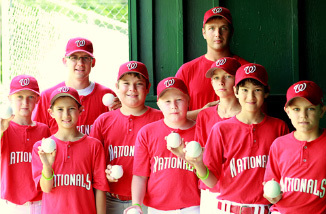 Put together a team of community members or sponsor a game for a local little league. Follow these easy steps below or come up with a plan of your own. Either way, have fun and know that you are making a difference. Never underestimate the power of what you, one person can do - especially when it comes to fighting pediatric cancer. Reserve a field, gather the players, get sponsors and spread the word! Let the local newspapers and radio stations know the time and place so the community can come and cheer you on. Place an order for the NVRQT Games Kit by making a donation to the charity on this site. Your kit containing 12 NVRQT balls and wristbands should arrive within a week or two. While you play, pass a hat around to gather donations for PCRF in honor of your NVRQT event. After you finish, have all the players and fans sign the NVRQT balls with encouraging words. Gather up the signed NVRQT balls and take them to a local clinic where you can bring some cheer to the kids undergoing treatment. Let them know that there's an entire community rooting for them. Just because the game is over doesn't mean the fun is done. We are always excited to share your NVRQT experience, so head over to our Facebook page and post photos and videos of your event and we'll give you a special shout out.